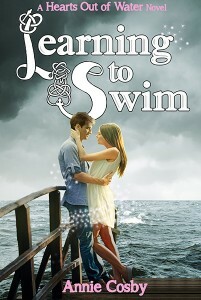 Learning to Swim is the first book in a new series, and it’s off to a good start. When Cora’s mother forces her to go on summer holiday, Cora thinks her summer is doomed. Her parents belong in a world of parties, wealth, and the elite. While Cora spends half the time in that world, she also takes some time to visit the world of the locals on her holiday, and to discover more abot mythology and folklore than she ever thought possible, thanks to the batty Mrs. O’Leary. But Mrs. O’Leary isn’t the only local Cora meets. There’s also Ronan, a gorgeous and mysterious boy. But Cora’s world is miles away from Ronan’s, and even the magic of summer may not succeed in bringing them together. Cora was an okay character. She had a mind of her own, but she was also thoughtful and considerate, at least in as far as a teenager can be any of those things. Ronan was fun too, everything one would look for in a summer fling. But the character that really intrigued me was Mrs. O’Leary. Her story were amazing. I loved the folklore, the mystery, the ancient mythology, all mixed together. And of course, Mrs. O’Leary’s personality was entertaining as well. The writing was great. Dialogue and descriptions were spot on. While the story had a slow start, the pacing picked up after a few chapters, and I was impressed by how endaring the story was, and how much I began to like the characters.